As the Civil War reached its peak, Grant sought to win control of the Mississippi Valley. In February 1862, he captured Fort Donelson in Tennessee, which was the first Union victory of strategic importance. When the Confederate commander asked for terms, Grant replied, "No terms except an unconditional and immediate surrender can be accepted." The Confederates surrendered, and President Lincoln promoted Grant to major general of volunteers in 1863. As the fierce battles of the Civil War continued, some began to question General Grant's military leadership. At Shiloh, Grant fought one of the bloodiest battles in the West. Some "called for him to be replaced." President Lincoln fended off demands that Grant be removed by saying, "I can't spare this man — he fights." With President Lincoln's support, Grant was determined to move ahead to victory. He captured Vicksburg, the key city on the Mississippi River, which cut the Confederacy in two. He then broke the Confederate hold on Chattanooga, Tennessee. Lincoln appointed Grant General-in-Chief of the Union Army in March 1864. Grant directed Sherman to advance through the South while he directed the Army of the Potomac to pin down General Lee's Army. After the Overland campaign in the spring of 1864, City Point, (the city is named Hopewell today) Virginia, served as General Grant's Headquarters of the Armies of the United States. From City Point, Grant directed the movements of the various Union troops across the country. His primary goal was to destroy General Robert E. Lee's Army of Northern Virginia. As Sherman and Grant moved farther into the Confederate strongholds, it became clear that the final battles of the Civil War were at hand. President Lincoln, anxious for the war to end, traveled to City Point and Grant's headquarters. From March 20 to April 8, 1865, the President met with Grant and his officers to discuss the final push into Petersburg. They also talked about the conditions for reuniting the nation after the war. At the end of March, a "war council" conference was held between the President, Generals Grant and Sherman, and other key military leaders. They discussed battle plans that they hoped would end the war. Grant then moved his headquarters into Petersburg so he would be near the final battleground. President Lincoln stayed at City Point, where it is reported that he dreamed of his own death. Interestingly enough, Lincoln did not tell anyone at City Point of his strange dream while he was there. Instead, he reportedly first mentioned it to his wife and others during a social gathering, days later when he returned to Washington, D.C.
General Grant's military strategy was on target as he defeated General Lee at Petersburg. Finally, on April 9, 1865, Lee surrendered at Appomattox Court House. 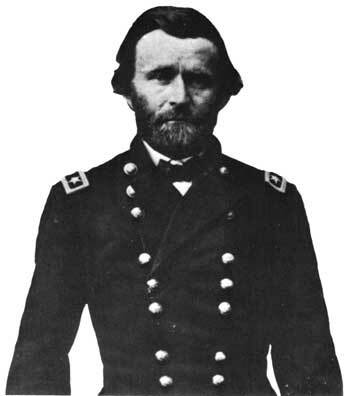 Grant wrote generous terms of surrender that assisted in the process of uniting the nation again. A main part of Grant's terms included provisions that prevented future trials for treason. Jefferson Davis, President of the Confederacy, was arrested for treason and spent three years in prison at Fort Monroe. But Davis, however, never went to trial for treason. After the Civil War, Grant served as the Secretary of War from August 12, 1867, to January 14, 1868.